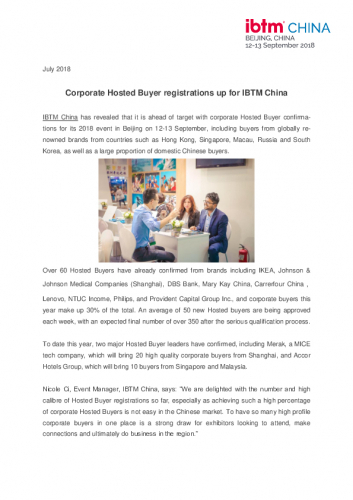 IBTM China has revealed that it is ahead of target with corporate Hosted Buyer confirmations for its 2018 event in Beijing on 12-13 September, including buyers from globally renowned brands from countries such as Hong Kong, Singapore, Macau, Russia and South Korea, as well as a large proportion of domestic Chinese buyers. Over 60 Hosted Buyers have already confirmed from brands including IKEA, Johnson & Johnson Medical Companies (Shanghai), DBS Bank, Mary Kay China, Carrerfour China，Lenovo, NTUC Income, Philips, and Provident Capital Group Inc., and corporate buyers this year make up 30% of the total. An average of 50 new Hosted buyers are being approved each week, with an expected final number of over 350 after the serious qualification process. To date this year, two major Hosted Buyer leaders have confirmed, including Merak, a MICE tech company, which will bring 20 high quality corporate buyers from Shanghai, and Accor Hotels Group, which will bring 10 buyers from Singapore and Malaysia. Several new international exhibitors have confirmed for this year’s event including: Meliá Serengeti Lodge, Corinthia Hotels, West Prairie Tourism, GL Events, Astana CVB and Russia CVB, as well as returning exhibitors such as San Francisco Travel Association, Sri Lanka Convention Bureau and South African Tourism. 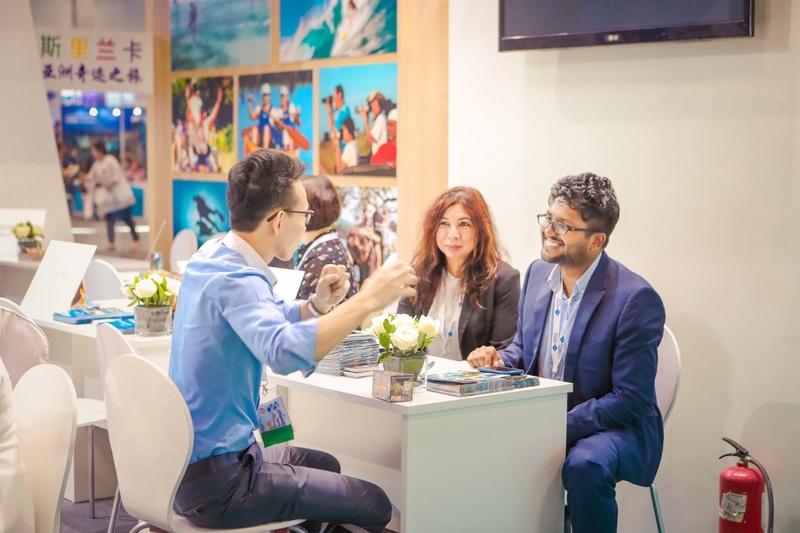 IBTM China is the number one event for the region’s MICE industry, gathering over 5,000 global meetings industry professionals for two days full of pre-scheduled business meetings. The event uses IBTM’s bespoke ‘matchmaking’ software to provide each Hosted Buyer with a pre-arranged schedule of meetings to ensure that buyers only meet with people with whom there’s a great chance they’ll do business. IBTM, part of Reed Travel Exhibitions (RTE) is the world’s leading showcase for the meetings and events industry (also known as MICE) with a portfolio of 5 global and regional events providing business solutions on 5 continents. They include IBTM World, IBTM Arabia, IBTM Africa, IBTM Americas and IBTM China. 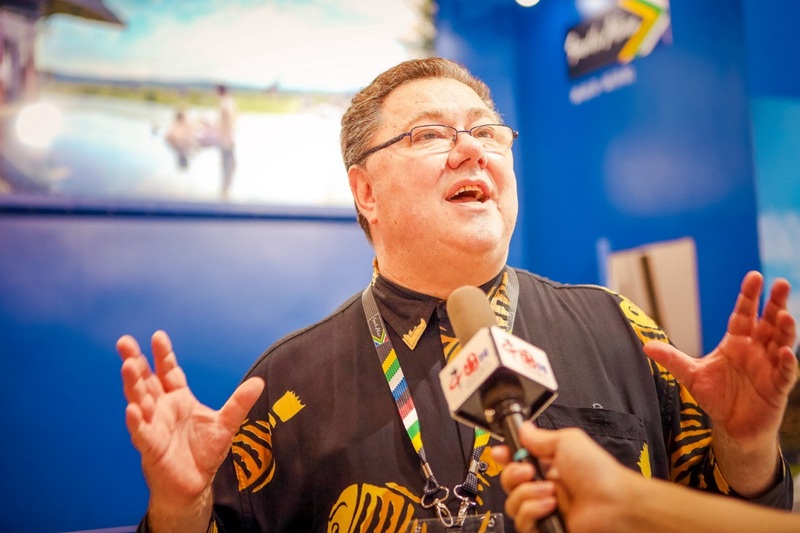 Reed Travel Exhibitions (RTE) is the world’s leading travel and tourism events organiser, with a wide-ranging portfolio of 22 international events in 13 countries throughout the Americas, Europe, the Middle East, Asia Pacific and Africa. Its market-leading, business-to-business events cover all elements of travel and tourism, including leisure travel, luxury travel, meetings, events, incentives and business travel, as well as golf travel.